Like it or not, alternative powertrains are treading into the automotive industry in a similar way to all high-technology formats. Starting with a few high-priced examples featuring limited capabilities, the technology evolves quickly soon after. Increased production of this new technology is followed by decreases in pricing which has led to hybrid cars being embraced by a bigger market. With many plug-in hybrids and all-electric cars costing north of $30,000 even after government incentives, the more established gasoline with electric assist hybrid powerplants are finally starting to prove themselves a cost effective platform. Priced at a $1,500 advantage over the Toyota Prius in 2010, the Honda Insight pricing against its popular gas/electric hybrid competitor drops to an even more affordable level in 2011 with the introduction of new, lightly-equipped Insight. Starting at $18,200, the 2011 Honda Insight base model takes over the LX model’s position on the low-end of the price scale. The base model of the Insight hybrid accomplishes the entry-level price by the subtraction of a handful of features. Audiophiles will probably be the hardest hit by the base model equipment of the 2011 Honda Insight. Still featuring the 160-watt stereo system with CD player and MP3 playback capability, sound pulsates out of only 2 speakers. An USB audio connection is also deleted from the stereo’s functionality. The use of a less expensive seating along with the removal of a center console/armrest will be noticed by as many as 5 occupants. Cruise control, electronic security system, steer-wheel mounted paddles and Bluetooth are other amenities buyers will realize missing on the 2011 Honda Insight base model in comparison to the heavier-equipped LX or EX trims. The lightest Honda Insight when it comes to standard features, the base model still includes a healthy asssortment of conveniences such as automatic climate control, power windows and LED taillights. The base 2011 Honda Insight will come standard with all the safety features found on the higher trimmed models. Anti-lock braking with electronic stability control, tire pressure monitoring system as well as front, side and curtain airbags are all included at no charge. Reentering the United States marketplace in its present 4-door hybrid configuration, the Honda Insight is having troubles winning over some of the more exacting standards of hybrid car buyers. Selling a modest 2.3 percent more vehicles in the first 10 months of 2010 than compared to 2009, the Honda Insight’s 17,789 units sold is dwarfed by the 115,065 Toyota Prius hybrids sold within the same time period. The Honda Insight complaints have cited the 4-door, 98 horsepower gas/electric vehicle for being a cruder example of the technology. There are still many who praise Honda’s engineering and views the current Insight as an affordable yet capable hybrid offering. 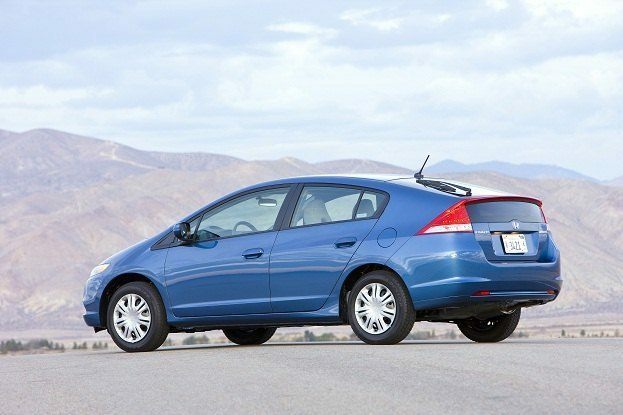 For 2011, the Honda Insight base model casually introduces itself as an option to gasoline-only compact sedans (considering even as an option to the mid-level Honda Civic). 1 Comment on "Honda’s New Inexpensive Insight for 2011"
Well it shows that Honda is trying to offer a more affordable option to those environmentally conscious folks who can't afford the more expensive counterparts.